Image of the Rectangular dual-pin-fed circularly polarised patch. 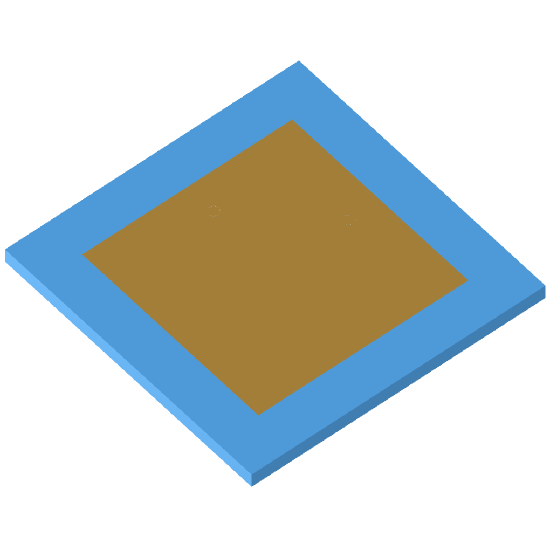 Microstrip or patch antennas are popular in the microwave frequency range because of their simplicity and compatibility with circuit board technology. The pin-fed patch, which probably has the simplest construction, is fed by bringing the inner conductor of a coaxial cable through the substrate and connecting it to the patch surface. Circularly polarised radiation can be obtained if an additional feed is connected to the patch such that it excites a mode spatially orthogonal to the first. The two feeds are driven by signals of equal amplitude but in phase quadrature to one another.